You count on us to bring you the most unique looks every year, looks that are designed to amaze your friends and family. New this year are many more foil designs and hanging cards, plus our new multi-choice Christmas cards that let you pick your own layout options in minutes. Mix It Up Ornament Christmas Cards Create your own look and message with these ornament-style Christmas cards that offer dozens of options from the message on the front to the color combination in the decorative center band. Foil Flakes Trifold Christmas Cards You’ll love the look of these gorgeous three-panel custom Christmas cards featuring two large photos and real foil-stamped snowflakes on the front. Faux Foil Wrapped Ribbon Booklet Christmas Cards These impressive Christmas cards are folded and tied with a black ribbon for friends and family to open like a present. Plus, touches of faux foil let you achieve an affordable glam look. Multi Choice Christmas Cards Here’s just one of our Multi Choice cards, featuring quick and easy options for the front and back layout, background patterns or colors. Shown: Blushing Blooms Christmas Cards. 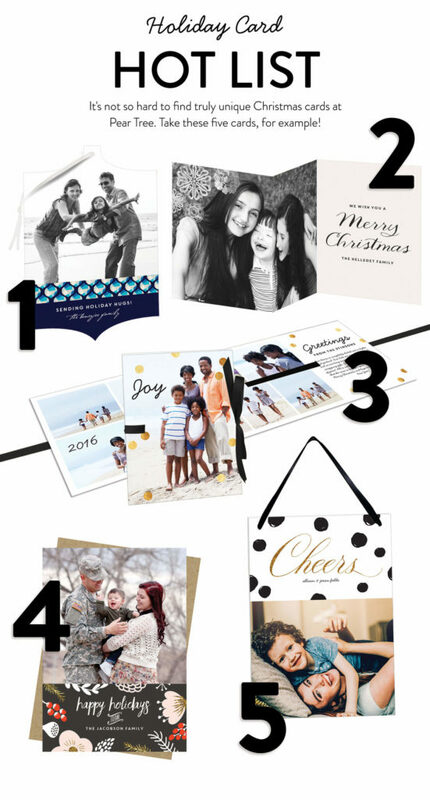 Dot Happy Premium Christmas Cards Give your friends and family a reason to hang on to your Christmas cards. The heavy, double thick paper has an impressive feel, while black satin ribbons make it easy to hang from doorknobs, Christmas trees or anywhere they like. Be sure to check out the entire collection of holiday cards at Pear Tree for more standout looks!